QUEZON CITY – The conspiracy to kill the FOI bill in the 14th Congress is unfolding yet again, this time in the 15th Congress. House Majority Leader Neptali Gonzales II on Monday started sounding the death knell for the Freedom of Information (FOI) bill, saying in two news reports that “many lawmakers” do not want to pass it. He cited as reason their fear that hao siao or illegitimate media members will abuse it to attack politicians like him and the members of Congress. “Ang problema kasi sa FOI, kapag ang impormasyon ay napunta in the hands of unscrupulous media. Ngayon lang may tumitira ng hao siao, bibigyan mo pa ng ganyang armas. Eh baka wala ng manungkulan sa gobyerno dahil sa takot na titirahin sila palagi,” Gonzales was reported as saying in the tabloid Remate. A similar news report with the same statements attributed to Gonzales also ran in Pilipino Star Ngayon the same day. As House Majority Leader and concurrent Chairman of the powerful Committee on Rules, Gonzales oversees the preparation of the Order of Business and Calendar of Business of the House. His committee may declare a bill urgent so it may be considered according to a fixed timetable, as well as a deadline for it to be reported by the committee concerned. But Gonzales would not intervene to get Rep. Ben Evardone, chairman of the House Committee on Public Information, to call a hearing on the FOI bill. Instead, by his statements Gonzales merely confirmed Evardone's earlier claim that Evardone’s refusal to act on the bill was consistent with instructions from the House leadership. To be sure, Gonzales is no stranger to conspiracies in the House to kill FOI. He was Senior Deputy Majority Leader of the 14th Congress under then Speaker Prospero Nograles, which had also refused to calendar the FOI bicameral conference report for ratification. The roll call tally, however, had all the earmarks of hao siao reporting by Nograles, Gonzales, and the leaders of the 14th Congress. At least eight House members who had been documented by media’s video footage and by their own statements to have been physically present on the floor during the roll call. But in the dishonorable manner of hao siao reporting by the leaders of the 14th Congress, the eight legislators were marked absent. The eight would have brought the number of members present to more than the required quorum. Gonzales himself was among those erroneously marked absent the day the 14th Congress killed the FOI bill. At the time, Gonzales was a senior member of the ruling Lakas-Kampi-CMD. He made a well-timed defection to the Liberal Party about a month before the 2010 elections when then the election of presidential candidate Benigno Simeon C. Aquino III had become fait accompli. This well-timed act of evident turncoatism earned for Gonzales the coveted Majority Leader position in the 15th Congress. Like Gonzales, Evardone was also a belated defector from Lakas-Kampi-CMD. He took his oath as Liberal Party member in June 2010. And now, to justify why the FOI bill remains stuck in his committee, Evardone in a recent television interview has so casually, if quickly, tossed blame for the failure of the bill to pass on the Liberal Party. He had said that the FOI has not moved past his committee because it is not a priority of President Aquino, and neither does the Liberal Party have any party stand on FOI. In truth, even if Gonzales and Evardone were discounted from the equation, a fortnight ago at least 117 members of the 280-member House of Representatives had signed on to a public statement they called “Declaration of Commitment to Pass the FOI Bill.” In contrast, Gonzales can only refer to unnamed "many lawmakers" as being opposed to the bill. The true and original LP stalwarts in jest call Gonzales, Evardone and their likes who are recent converts as LP or “Lakas Pala” members. But perhaps they should do better than set up the FOI bill for slow death by merely raising the spectre of hao siao reporters taking liberties with information to attack politicians like them. By all indications, the real fear about the FOI bill that spooks Gonzales, entrenched politicians and political dynasties in the country is that it will open the door to legitimate public scrutiny into their official acts and transactions, and enable the people’s right to know the good, the bad, and the ugly about them all. CAMP SEC. RUPERTO K. KANGLEON, Palo, Leyte – The leadership of Police Regional Office 8 is hoping to improve its crime-busting capability with the recruitment of 117 more warm bodies for police visibility and anti-crime operations. “This will be a big boost on our strength. With additional personnel, we hope to close the gap in terms of police to population ratio”, PCSupt Elmer Ragadio Soria, PRO8 Regional Director said. Eastern Visayas has a police to population ratio of one policeman for every 666 population while the ideal ratio is 1:500 to conform to international standard. Soria added that those who will be recruited are expected to further beef-up the existing PNP personnel complement for law enforcement and public safety operations of the PNP in the region. The Regional Director also informed that he had requested the National Headquarters for an additional quota of 130 more new recruits to increase the second semester 2012 quota to 247. He however stressed that only half of the total figure can be considered as additional force to the 6,140-strong PRO8 personnel while the other half will serve as replacement to those who will or are expected to retire, resign and dismissed from the service. Based on PNP records, an average of 2,500 to 3,000 policemen leaves the organization yearly for various reasons aside from retirement, dismissal and resignation. In year 2011, PRO8 have 154 policemen who have either compulsory or optionally retired while 20 others were dismissed from service. The Regional Personnel and Human Resource Management Division of PRO8 had started accepting initial application folders last September 3 up to September 14 this year. Applicants are required to undergo recruitment processes of Neuro-Psychiatric (NP) Screening; Physical, Medical and Dental Examination; Physical Agility Test; Drug Test; Complete Background Investigation; and Final Board Interview. Oath-taking ceremony for new recruits will be held on November 16, 2012 formalizing their appointment to the rank of Police Officer 1 (PO1) with a basic monthly salary of P14,834.00 with allowances and other non-cash benefits. 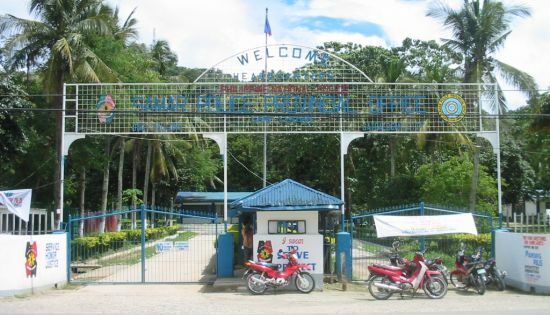 Upon appointment into the service, the recruits will undergo the mandatory Public Safety Basic Recruit Course (PSBRC) at the Philippine Public Safety College – Regional Training School 8 (PPSC RTS8) for six months after which the trainees will undergo another six months of Field Training Program (FTP) before they are assigned to full duty status in the Regional Public Safety Battalion 8 (RPSB8). The recruitment program is part of the modernization program of the PNP, in which P2 billion was allotted to the organization for recruitment of additional personnel and procurement of equipments. The National Police Commission has authorized the PNP to recruit 6,000 more police personnel this year as part of the 2012 Regular and Attrition Recruitment Program which is intended to replace the projected number of personnel who will be separated from the service due to retirement, resignation, and dismissal for cause, Soria explained. MANILA – Greenpeace has expressed alarm at a recent scientific publication that suggests researchers, backed by the US Department of Agriculture (USDA), fed experimental genetically-engineered (GE) ‘golden rice’ to 24 children in China aged between six and eight years old. Greenpeace East Asia first heard of this experiment in 2008 and immediately informed the Chinese Ministry of Agriculture. The Ministry confirmed with Greenpeace that no ‘golden rice’ had been imported and ostensibly, the trial had been stopped. However these new findings reveal that this directive had not been upheld. Greenpeace believes that ‘golden rice’ is an irresponsible and dangerous way to address Vitamin A Deficiency (VAD). ‘Golden rice’ does not address the underlying causes of VAD, which are mainly poverty and lack of access to a more diverse diet. Because it encourages a diet based on one staple rather than an increase in access to the many vitamin-rich vegetables, ‘golden rice’ could, if introduced on a large scale, exacerbate malnutrition and ultimately undermine food security. While VAD remains a problem in some parts of Asia, some countries such as Bangladesh, the Philippines and Pakistan, have made considerable progress in combating VAD in recent years: through Vitamin A supplementation, food fortification and dietary diversification. While more work needs to be done to eradicate the problem, Greenpeace believes that these existing and successful solutions – particularly dietary diversification which directly addresses malnutrition – are the ones that must be supported, rather than channeling millions of funds into ‘golden rice’ development. The problem of ‘golden rice’ is a concern in the Philippines, which is earmarked to be one of the countries where this GMO will be first launched. The International Rice Research Institute (IRRI), based in Los Banos, Laguna and the Philippine Rice Research Institute (PhilRice) based in Muñoz, Nueva Ecija, are the main proponents of this project. Open field trials of GR are now currently ongoing in Nueva Ecija, Ilocos Norte and Camarines Sur, exposing conventional rice crops – the country’s staple food – to GMO contamination. “Golden rice’ is still a myth, and worse, it carries with it all the environmental and health risks associated with GMO crops. Spending even more time and money on ‘golden rice’ development is not only environmentally irresponsible, but also a disservice to humanity,” he added. Greenpeace is demanding that IRRI and the Department of Agriculture stop field trials of ‘golden’ and other GE rice varieties. Organizations that are funding the development of ‘golden’ rice should shift their resources to boost current efforts that are tackling VAD, particularly dietary diversification and empowering people afflicted by the deficiency. CAMP SEC. RUPERTO K. KANGLEON, Palo, Leyte – At least three persons were arrested by the police in a series of operations in the campaign against the proliferation of loose firearms in the region, the Police Regional Office 8 top official reported today. “The implementation of law on unlicensed firearms remains as one of our priority in our anti-crime drive.”, PRO8 Regional Director PCSupt Elmer Ragadio Soria disclosed as he commended his men for the said arrests. He added that the recent police campaign succeeded due to active participation of concerned citizens who tipped off police authorities on such illegal activity, further noting that two of the recent operations were implemented through applications of search warrants. Soria said a raiding team seized a caliber .38 “paltik” revolver and five pieces live ammunition from the house of Aniceto M Salentes, 46 years old, married, fisherman in Brgy. Uson, Caibiran, Biliran. The police official said the raid was conducted past 6:00 in the morning of September 1 by elements of Caibiran Municipal Police Station led by its chief, PSInsp Restituto Reglos. The raid was based on a warrant issued by Hon Constantino F Esber, presiding Judge of RTC Branch 37, Caibiran-Naval, Biliran dated August 30, 2012. Soria said that the suspect was arrested during the search witnessed by Brgy. Chairwoman Violeta Torlao, Brgy Kagawad Robin Mondido and Felix Dalompon. The Regional Director said a check with the Firearms and Explosive Division in Camp Crame, Quezon City showed the firearm have no license. He said Salentes has been charged with illegal possession of firearms and ammunition at the Provincial Prosecutor’s Office in Naval, Biliran docketed under NPS No. VIII-14-INQ-2012-0027. Meanwhile, at around 6:30 AM of August 30, 2012, joint elements of CIDG and elements of Liloan Police Station led by PSInsp Alex Prisno implemented the Search Warrant Number R-003-S-2012 issued by Hon Rolando Gonzales of RTC Br 39, Sogod, Southern Leyte dated August 30, 2012 at the house of a certain Rowie Baay, 37 years old, married, jobless located at Brgy. San Roque, Liloan, Southern Leyte. The search resulted to the arrest of the suspect and the seizure of the following: one (1) unit caliber .357 revolver “Paltik”, three (3) pieces fired cartridge for caliber .357, one (1) black holster for short firearms and one (1) bullet holder. The search was conducted in the presence of Brgy. Kagawad Diana Adona and Eleazar Perro while the suspect and the confiscated items were brought to the police station for proper disposition. Relatedly, at around 2:30 AM of September 2, at the front row of a videoke bar located at the corner of Orquin Street and Magsaysay Boulevard in Calbayog City, elements of Samar Provincial Public Safety Company (SPPSC) led by PInsp Silvano Soteraña arrested one Mark Magbutay, 32, married and a resident of Purok 7, Brgy Hamorawon, Calbayog City, Samar for carrying one (1) unit caliber .357 revolver without serial number loaded with four live ammunition. Suspect and the confiscated items were turned over to Calbayog City Police Station and Magbutay was subsequently charged with violation of PD 1866 as amended by Republic Act 8294 at Calbayog City Prosecutor’s Office docketed under NPS No. VIII-10-INV-121-00055. Soria further informed that for the month of August 2012, thirteen persons were arrested by PRO8 for violations of the law on illegal possession of firearms, resulting in the confiscation of 29 loose firearms of different caliber, 5 were classified as high-powered while the rest are low-powered firearms. “This recent success will significantly reduce the prevalence of shooting-related incidents in the region as loose firearms are one of the main reasons for the proliferation of crimes,” Soria further said. MALACAÑANG – The House Committee on Appropriations on Tuesday approved President Benigno S. Aquino III’s P2.7 billion spending plan for the Office of the President (OP) for fiscal year 2013. The OP’s proposed budget was presented by Executive Secretary Paquito N. Ochoa Jr. to the House Committee on Appropriations and was quickly cleared by committee members in the spirit of inter-parliamentary courtesy and in deference to a co-equal branch of government. The 2013 OP budget is 4.26 percent higher than this year’s appropriation of P2.7 billion, with the bulk of the increase going to the funding requirements for salary adjustments under the fourth tranche of the Salary Standardization Law (SSL), as well as major repairs, rehabilitation and improvement of various buildings and facilities inside the Malacañang Complex. The P111-million increase in the OP’s proposed spending package for the next fiscal year would go to Personal Services (PS), up P39 million to P552.9 million; and Capital Outlays (CO), from P150.6 million to P300.4 million. The OP has slashed the allocation Maintenance and Other Operating Expenses (MOE) by P77million to P1.88 billion, from the current fiscal year’s P1.96 billion. Appropriation for Capital Outlays under the OP’s proposed budget measure has been adjusted upward to fund the improvements of various buildings and facilities inside Malacañang, some of which are over a hundred years old. Presidential residences outside the Malacañang Complex will also undergo repairs namely, the Mansion House in Baguio City; Malacañang Park in Nagtahan, Manila; and the Malacañang sa Sugbu in Cebu City. TACLOBAN CITY – Since September 1, 2012, the Home Development Mutual Fund or Pag-IBIG has started requiring all its members to transact with the Fund using their Membership Identification (MID) numbers. Manager Paulino C. Talacay of Pag-IBIG Fund Tacloban Branch informed the Philippine Information Agency that this is part of the Fund’s transition to an enhanced system that will make its services even faster and more efficient for its members. Manager Talacay said that with this latest development, the employers are encouraged that every time they remit the contributions and loan payments of their employees, their MID numbers must be indicated in the remittance forms. “Without the MID numbers, processing of transactions may have delays,” Manager Talacay said. As such, Manager Talacay advised members to indicate the MID when remitting and submitting such documents as Members Contribution Remittance Form, Short Term Loan/Multipurpose Loan Applications and Monthly Remittance Schedule for Multi-Purpose Loans and Housing Loans. The Pag-IBIG manager also stressed that members or employees without MID mat secure a Registration Tracking Number (RTN) by registering online through the e-member Services facility at www.pagibigfund.gov.ph. “The RTN can be used in place of the MID,” Manager Talacay said. Moreover, for faster posting of Pag-IBIG contributions and loan payments, member-employees are also advised to submit a softcopy (computer file) of the remittance schedules with the fund. “They can secure our easy-to-use soft copy format at all Pag-IBIG Branches or online at www.pagibigfund.gov.ph,” Manager Talacay added. CATBALOGAN CITY, Samar – Some 40 members of the Philippine National Police (PNP) field training program have been augmenting the police organic force in the city of Catbalogan. In an interview, Catbalogan City Police Superintendent Avelino Doncillo said that these new recruits have been helping out in the crime prevention efforts of the city police. “This is why we have enhanced police visibility during business hours in the commercial district, then, there is also a 7-man team with a patrol car deployed at the Public Market during ‘market hours’,” the chief told PIA. “These men have been on hand to fill up security gaps caused by the shortage of organic personnel,” Doncillo said. Meanwhile, Doncillo said that Catbalogan is generally peaceful. “The one month fiesta activities and Samar Day went on smoothly with no untoward incident,” he proudly claimed. One thing though that is bothering the chief is the presence of minors that have been doing petty crimes like cellphone snatching and thievery. “We have coordination with the City Social Welfare Officer, about these minor offenders but each time, because of the law, they are out there again,” Doncillo lamented. He suggested that since the present generation have matured earlier that the age of discernment be lowered from 18 to 12. He is calling the attention of lawmakers for the necessary amendments of the Juvenile Justice System. CAMP LUKBAN, Catbalogan Samar – The 8th Infantry Division in coordination with all Government Agencies and Civil Society Organizations joins the whole nation in the observance of the Annual National Peace Consciousness Month with the theme “Ikaw, Ako, Tayo, Magkakaiba, Nagkakaisa Para sa Kapayapaan” which was done on 3 September 2012 at Headquarters 8ID, Camp Lukban, Catbalogan City. 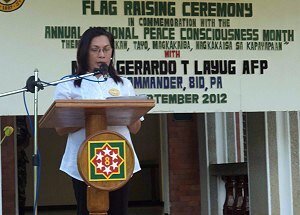 OPAPP Samar provinces area manager Emy Bonifacio reads the peace message of Sec. Teresita Deles. This month-long activity commenced with a Flag Raising followed by a Harmony Prayer by MSg Marcelino B Bulusan, Division Sergeant Major and Pledge for Peace which was read by Lt Colonel Ricardo G Ellorda at the 8ID Parade Ground. Furthermore, to let the citizenry of this region feel the concern of the military, streamers bearing the essence of peace were displayed. Likewise, the message of Secretary Teresita Q Deles from the Office of the Presidential Adviser on the Peace Process was read by Ms. Emy Bonifacio, OPAPP representative, Samar Province stating that, “Now is the time to make Peace and don’t let it happen for tomorrow”. According to his message, MGen Gerardo T Layug, Commander, 8ID, “We in the military profession is one of the government agency who advocates Peace as embodied in the Internal Peace and Security Plan Bayanihan of the AFP”. “Winning the Peace together with other stakeholders is our primary tasks in attaining a just and lasting peace in the region and the rest of the country,” added Layug. The 8ID calls for all stakeholders to do their share and join in advocating true Peace in the region.